Photo by Vincent Pardieu; © GIA. 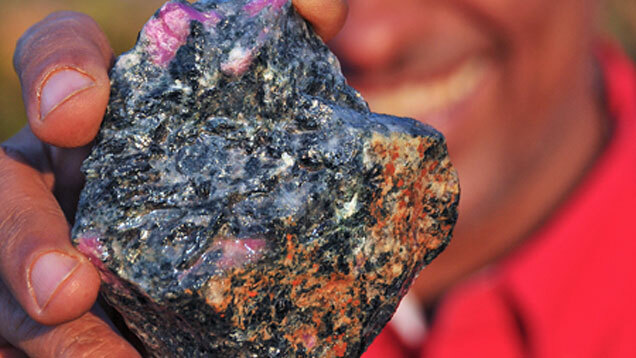 Abdul Mahomed, majority owner of the Chimwadzulu mine, with rubies in their amphibolite matrix. CARLSBAD, Calif. – Nov. 20, 2014 – In 1958, a ruby and sapphire deposit was discovered about 145 kilometers south of Malawi’s capital of Lilongwe on Chimwadzulu Hill. Although this is one of the oldest known gemstone deposits on the African continent, very little has been published about its production in recent years. In late September, GIA Field Gemologist Vincent Pardieu, videographer Didier Gruel and expedition guest Stanislas Detroyat journeyed to Malawi to collect samples for GIA research activities, and to document and share their findings from the deposit. In 2008, Nyala Mines Ltd. began to work the deposit, while Columbia Gem House Inc. took charge of cutting, marketing and selling of the stones. In 2013, Malawian national Abdul Mahomed acquired 80% of the mining operation. According to Mahomed, the acquisition process is expected to be completed soon and the Malawi government and a local consortium will hold the remaining 20%. Since then, the mining operation has been renovated and the areas originally worked in 1958 have been further explored. Production is expected to begin in 2015. In an effort to support the local community, Columbia Gem House has set up the Dzonze District Development Fund and is supporting two villages near the mine through a school at Kandoma and a hospital in Katsekera.